Jake and I discovered puddles on the slides at the playground. I told him they came from the rain. He looked up, pointed and said, “In the ‘ky”. It made me so proud. 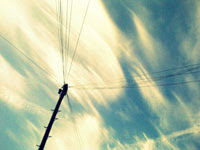 Later the sky clouded over. 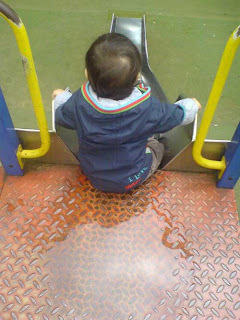 He pointed up and said, “Dark!” He wasn’t ready to go yet, but then we got our bottoms wet on the slides. He sat down in a puddle, and I slid down after him. He was soaked right through to his nappy. I took his trousers and shoes off and put him in his pushchair with our picnic blanket over his legs.